The shape of things to come. Well of course Cocoon is always exactly that. What we mean right now is that it is time to reveal how our amazing 2017 line-up fits together. It is a fantastic jigsaw and one that as ever continues our vision – keeping alive the unifying spirit and community of Ibiza with smouldering hot joyous parties. You feel pretty special when you get 18 years old, nothing is impossible especially when against all the odds you have made Mondays fashionable. Never making things complicated. Every single artist has the space to express themselves in stunning surroundings and in front of our Cocoon crowd. So now choose your Mondays. Or you can take a lucky dip from the 19 Mondays we will be offering. We guarantee you will come out a winner. Scroll down. So many more names to savour, Solomun is back for the now annual exclusive swap with Sven and not only that we are delighted to point you at new additions to the line-up. The luxurious Luciano, POPOF and Adriatique will be adding so much value to number 18. To support all of this excitement. What a year and what a job done by Dub Video Connection in 2016. They will be handling video, lights and installations once again and dazzling us all in this momentous 18th season. Before you devour the schedule we must sew some other seeds. 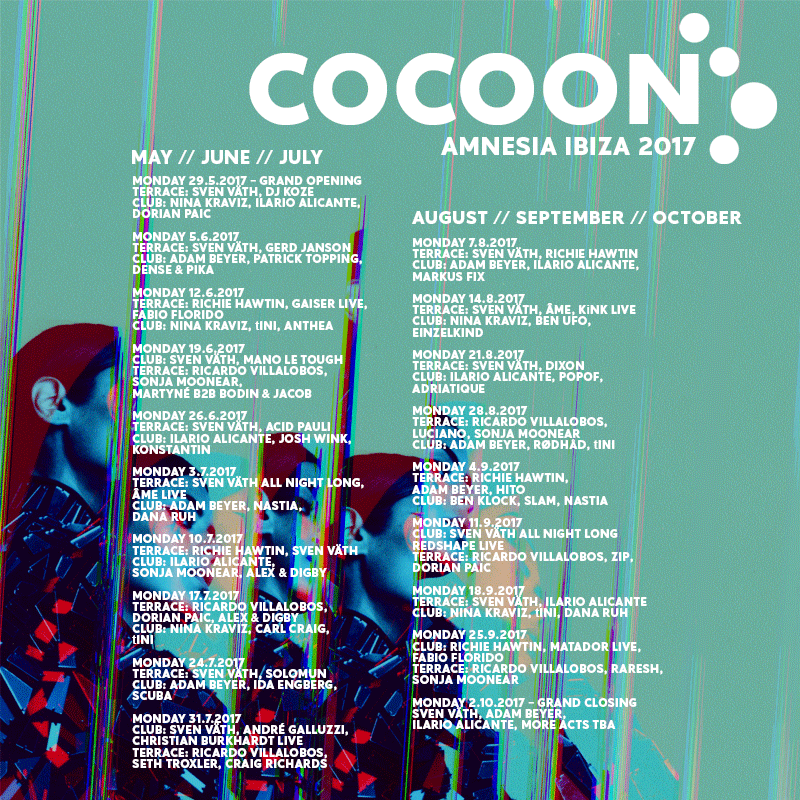 Cocoon @ Tipic Formentera will also be back every Thursday from the 15TH June and you are not going to believe the line –up that is emerging. Cocoon has always owned Monday night as you know but these intimate Thursday nights are now part of the picture.